THE BLACK BEETLE is here! Under the watchful gaze of the mysterious Labyrinto, Black Beetle fights for his life! Is this the doing of a man that Black Beetle thought was dead? Could a zombie mobster be commanding the foes of Colt City’s dark avenger?! If he survives the night, the investigative insect will be left with questions to ponder as he takes his investigation . . . to the morgue! If you missed the 3 part story in Dark Horse Presents, here's your chance to read it all in one place. And if you didn't miss the DHP issues, than you can still pickup this collected edt because of the brand new and retro pulp cover and the few pages of extra material we put in this. I am so excited to share the latest 2 lobby cards with some support words from two comicbook legends and a huge inspiration of mine: Jim Steranko and Warren Ellis. I am lucky enough to call Jim a friend and he has always been enjoying The Black Beetle since the ashcan from a few years ago, so having his stamp of approval (being the Pulp authority he is) really means a lot to me. Issue #0 (collecting the NIGHT SHIFT 3-parter published in DHP plus extra material) is coming out in less than two weeks and there is still time to put in pre-orders for issue 1 coming out in January. Speaking of issue 1 of NO WAY OUT, here's an excerpt of an interview that was recently published on CBR (done with Daniel Glendening) in which I talk a bit of the story, The Black Beetle, and show some sneak peek of the book (first 3 pages). Back alleys shrouded in darkness and long shadows cast by dim streetlights, all-night diners and wise guy gangsters, esoteric artifacts and Nazi secret agents: this is the world readers have come to associate with classic noir, and the world readers will find in writer/artist Francesco Francavilla's "The Black Beetle" from Dark Horse Comics. With the release of "The Black Beetle" #0, collecting the three-part story "NightShift" that originally ran in Dark Horse's anthology series, "DarkHorse Presents," on December 19 and the subsequent launch of "The Black Beetle: No Way Out" four-issue miniseries on January 16, Francavilla continues his impressive rise in the comic book industry. 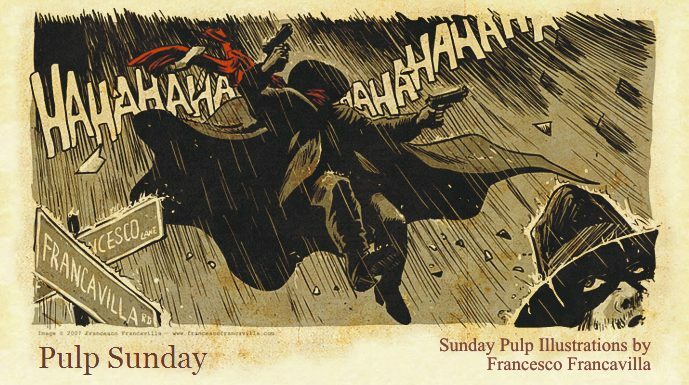 Francavilla nabbed the 2012 Eisner Award for Best Cover Artist as well as the 2012 Eagle Award for Favourite Newcomer Artist. He brings his signature graphic, pulp aesthetic to every panel of his developing series, eagerly sharing the process on his "Black Beetle"-centered blog. "We are still at a very early phase of the Black Beetle's history," Francavilla told Comic Book Resources. "We know he operates in Colt City and we know he is some sort of masked vigilante or hero. The events in 'Night Shift' span one night -- We've learned what the Black Beetle is capable of, and where his 'base of operations' is located." The Black Beetle is a hero, to be sure, and he's willing to take a bullet in defense of the innocent. However, he is not without his flaws, as hinted at in "Night Shift," and Francavilla compares him to Humphrey Bogart's character Rick Blaine in the 1941 film, "Casablanca." "[The Black Beetle] operates outside the radar of the law, which allows him to get information on criminal activity in Colt City and act accordingly, sometimes adopting unorthodox measures," said Francavilla. "He is a hero, after all -- not a perfect hero, but still a hero." "There is something else going on more than just simply 'protecting the citizens of Colt City,'" said Francavilla. "What is that 'something else?' That's one of the major plot-points that we'll discover a bit at a time through the next several issues in the series." "A main goal I had for this book is to explore several genres of the pulps," Francavilla explained. "'Night Shift' was a mix of spy-war story with some supernatural elements, while 'No Way Out' is more of a crime-mystery story." Francavilla cites the pulp and noir films and serials of the 1930s, '40s and '50s as direct influences on The Black Beetle, as well as classic pulp crime fiction writers like Dashiell Hammett and Raymond Chandler. The series is also clearly indebted to early masked-heroes like The Shadow and The Spider. "I always loved the high entertainment value of those stories," said Francavilla. "You didn't need to know much going in except that some bad guy is going to do something bad and The Shadow or The Spider was going to take care of him. Same goes with the gangster or crime movies from that period: you were going in without any pre-conception or knowledge of the characters; getting to meet the hero (or anti-hero) during the movie, and deciding to like or hate him or her at the end. You probably thought you knew how the movie was going to end, but somehow the whole experience wasn't as predictable as you thought. And that made it fun, entertaining. Hopefully I will be able to achieve the same effect with 'The Black Beetle.'" PULP Triple Feature! The SHADOW ~ The BLACK BEETLE ~ The SPIDER!